how do babies toddlers and children get along with Pets ? if you are thinking of getting a pet for your children you may want to consider the age of the them in case they are babies toddlers or older children . You may also be thinking what type of pet will you get for your self and or for the children . you may be considering along the lines of will a pet dog get along with a baby ? or should we buy a smaller pet instead such as a hamster, mouse or a even a goldfish. so today we look at all the reasons for getting a pet especially as many rescues get over run with pets after Christmas is finished. Who wants a pet ? the adult or the children? Who will be responsible for looking after the pet and providing the money for its upkeep? What type of pet are thinking of getting? How will you keep a child safe around the pets? When will you buy a pet ? Where will you keep the pet you are thinking of getting? 1.who wants a pet in the family ? if its the adult its a good choice, older children need encouraging daily to keep the pet fed watered cleaned out or exercising. 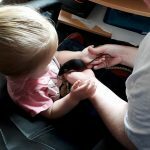 toddlers cant look after a pet by them selves but can be supervised by doing little tasks such as filling a food bowl or stroking the pet. 2. why do you want a pet ? are you are thinking something the family can look after together? 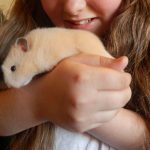 or for the children to learn about responsibility try a small pet if its for the children like a hamster mouse or goldfish. something that’s quite easy to keep and isn’t going to be a long term commitment just yet, you want to see that they can look after a pet that choosing a larger animal that lives for many years. you could choose a dog or cat later then once you know it will be looked after. 3.any pet costs money to keep whether its to buy food a house for its home vet bills etc, getting insurance its a good thing to do especially if its an animal that lives a long time. 4.what type of pet are you considering ? Dogs large breed around small babies ? do be careful after watching a baby grab a dogs tail as it learned to crawl, this friendly dog turned round and savaged the babies face, this was shown on Facebook and the scream will haunt you to this very day. Dogs should never be left alone with babies, babies want to explore reach for things grab for things even if it stood on a dogs tail could cause pain to a dog and a dog will bite if its in pain. always supervise little ones when coming into contact with any type of pet. 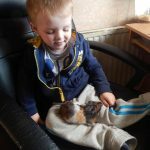 5.Keeping children safe around pets and small animals may bite so its important to be on stand by and very near to if babies and toddlers are around them. especially if they want to have a turn of holding a hamster or mouse. children over the age of 7 can handle them on their own with some supervision. good hygiene is important too by keeping pets cages clean and removing food bowls off the floor around crawling babies and toddlers. a toddler will find it fun to play around in cat litter yak. keep them out of reach of young children. 6.try to avoid buying a pet at Christmas time or birthdays. many petshops have been known to have one pet returned due to the kids being bored with it after a week of buying it so sad for the pet as its causes too much stress being rehomed over and over. 7.where will you keep the pet ? if its in a shed like a rabbit or guineapig make an outside enclosure rabbit proofed. they need space to run around instead of being cooped up in just a hutch. rabbits like to dig holes and tunnels. you may also want to insulate the shed inside as it gets really cold and some pets have been known to die due to it being too cold for them.